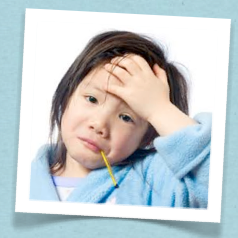 ... it is in the winter where we see such a large display of cold and flu symptoms? There are spring and summer colds. You may even have one, but even in those months the symptoms usually follow a big Easter celebration or in the summer, a big get together around July 4th. What do those holidays have to do with getting sick with a cold? We indulge heavily in sugar, processed carbs, excessive eating, late hours, the wrong oils for our fried chicken, and a whole host of other immune system attacking agents. It seems that during these holiday periods our limits on eating sweets and foods fried in bad oils (canola, vegetable, soybean, sunflower, safflower, etc.) 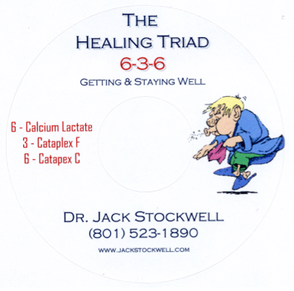 have no end, and as a result - our immune systems are literally stunted and slowed to a crawl. Couple this with much less sun exposure in the winter months providing far less Vitamin D, and as a result, we become sitting ducks for influenza A or B. Suddenly, the frightened among us are propelled out the door to go try the latest experimental concoction offered by Big Pharma, wherever their “Get Your Flu Shot Here” sign is hanging. You may have heard of Chandler Blake Webb? He passed from this life on Nov. 19, 2013, from a flu shot, after suffering for a month from severe brain damage. One doctor was honest enough among a flood of those who were not so honest, and came forward and admitted it was the shot the killed the boy. Why do these things happen to the innocent? Why must the innocent suffer? Why in this day and age do we still hang onto the notion that somehow injecting mercury into a child’s body, or ours for that matter, can somehow fool mother nature and bypass the laws of good health and nutrition? Here it is December, 2013, and we are getting ready to do it all over again. Less than one week after Thanksgiving was over I had a parade of patients coming into the office needing both spinal care and supplements for their over indulgence throughout the holidays. Christmas is next week and with all the additional over indulgences the holiday brings, there will be another round of sickness emerging about two weeks later--as that is about how long it takes for more sluggishness in the immune system to show up. Here are the facts. Bad oils combined with processed sugars spread inflammation throughout the whole system setting up the body for another round of opportunistic infections to begin; usually, with bacterial and viral agents already present in the body, they are just waiting for the immune system to go AWOL. Our bodies are filled with so much of these microbes, that 90% of the DNA inside us is not even human! It is microbial. Yet, we ignore this fact at our peril. Surrounding this ocean of microbes in our gut lies 85% of our immune system. Which is wisely located at the doorstep of all this disease causing contagion. What we eat and drink this day forward holds the keys to keeping the bad guys at bay, and strengthening that part of the immune system to keep it that way. 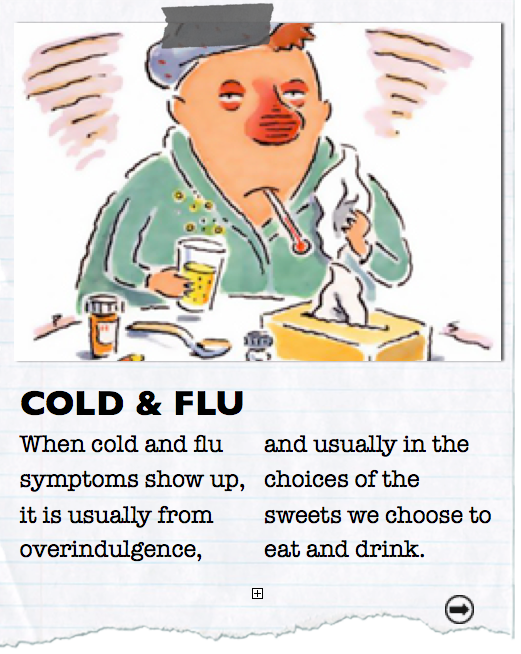 When cold and flu symptoms show up, it is usually from overindulgence, and usually in the choices of the sweets we choose to eat and drink. Along with this is a childhood supplement approach for the whole winter to keep the kids well and in school! And that is the challenge, isn’t it? To keep our kids, let alone us, well and active, healthy, and free of sickness. This young man I mentioned above, Chandler Webb, had six neurologists working on him when his brain began to fail as a result of the flu shot. He begged them to save his life as he slipped into a coma. What must have been going through his mind as he slowly lost consciousness? The medical team said the brain swelling, caused by the flu shot, crushed his brain stem. The brain stem houses the automatic parts of our life support systems, our breathing, our heart function, temperature control, blood pressure, etc. It is no surprise then that his symptoms followed a progression of dysfunction involving massive brain inflammation, step by step, until his own body pulled it’s own “plug.” The local TV station KSL, allowed comments and condolences on its web site, that is until the overwhelming number of comments turned into stories of side effects and suffering, also brought on by other flu shot victims. KSL was forced to take down the web page. Forced by whom, I’d like to know. In the end, our health is in our own hands. Whether we succumb to our own holiday debauchery, or allow a deadly needle to prick through our skin. Still, you might be saying to yourself: “Well, it’s Christmas! So I am going to indulge and have a cookie (or two),” and, to that I would reply: “Well, so will I! 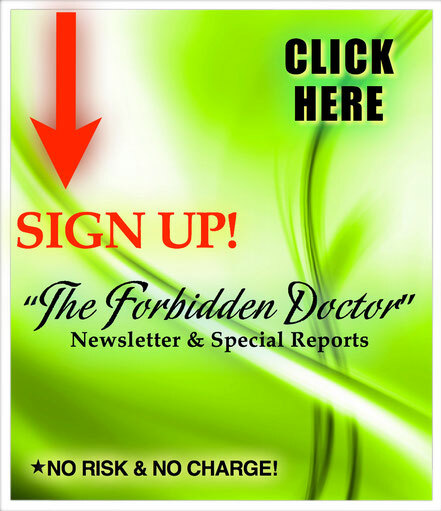 !” Just promise me you will do your immune system just one favor? 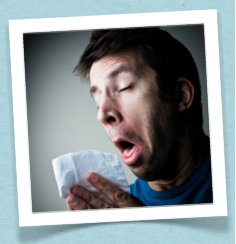 Purchase the “Cold & Flu Protocol” and we guarantee it will be one indulgence you won’t regret this Holiday Season. Thanks for reading our Special Report! Chandler was born in Salt Lake City, Utah. He was welcomed into a loving home by his parents, Blake J. Webb and Loralyn (Lori) Killpack Webb. He was the baby brother to Brandon and Mitch. He passed away peacefully after a hard battle in the ICU, suffering from severe brain damage, the result of a flu shot. Chandler was a special boy with a heart of gold. His happiness was contagious. He recently graduated from Brighton High School and was preparing to leave on a 2 year mission for his church. Chandler loved his brothers and family. He loved to hang out with his friends, boating, snowboarding, vacations, candy and the Utah Jazz! Chandler will be missed more than words can express. His death is so senseless. 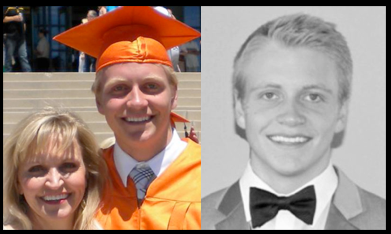 He is survived by his loving parents Blake (Dawn) Webb, Lori Webb, brothers Brandon , Mitchel (Breynn). His grandparents Lowell O. Killpack (Karen), Lynn Johnson, Dean and Lucile Webb (deceased). He has numerous Aunts, uncles, cousins and friends. Chandler's last 28 days were spent surrounded by so many who loved him. He may not have been able to wake up to see them, but we know that he knew they were there. The family wishes to thank the incredible people at the IMC ICU, especially the nurses and tech's who treated him with exceptional competence, dignity and love. Funeral services will be held at 11:00am on Saturday, November 23, 2013 at the LDS Church, 10945 South 1700 East in Sandy. A visitation will be held Friday evening from 6-8 pm at Larkin Sunset Gardens, 1950 East Dimple Dell Road (10600 South) and on Saturday from 9:30-10:30am prior to the services at the church. Online condolences may be shared at www.larkincares.com. Chandler you are a Champion! True at all times. We will always love you. Purchase the complete FDP#0003 (A) protocol offering prevention for a cold or flu!